11 days and 10 nights from: 3 450 € / pers. This itinerary offers challenging dives that will satisfy the most adventurous divers. Diving in the passes is extraordinary, which is why we require a certain level of scuba-diving certification. Look out for: sharks, mantas, dolphins, tunas, jacks, barracudas… a luxuriant fauna in density and diversity. The minimum water temperature varies between 25°C (77°F) in winter (September) and 29°C (84°F) in summer (march), with no thermocline and an outstanding visibility year-round. Arrival at the airport of Fakarava, welcome by the crew of the AQUA TIKI, then transfer onto the boat. Settling into your private cabin, tour of the village, water sports, swimming. Sunset with a cocktail, presentation of the trip, welcome party. Early-morning departure for Fakarava’s southern end, smooth sail through the lagoon, troll fishing. Anchorage off the Tetamanu village (pop. 6). Water sports or scuba-dive. Lunch. Land excursion, shell collecting, tour of the ancient village of Tetamanu and its church, scuba-dive or water sport of your choice, kayak. Option of a Polynesian party on land. Morning rise in Fakarava’s stunning lagoon, scuba-dive or water sports, then excursion to the untamed beauty of the “pink sand motu”, beach, swim. Lunch, scuba-dive or water sport of your choice. Sunset on the lagoon. Early anchorage off of a stunning, wild motu in Tahanea, scuba-dive or water sports, kayak, land excursion on a beautiful, deserted beach… Swims, shell collecting, lunch. Tour of the island in the RIB, scuba-dive, then trip back to the boat for a BBQ evening. Morning rise in Tahanea’s heavenly lagoon, early-morning scuba-dive looking for manta rays, water sport of your choice. Lunch, swim in crystal clear waters, scuba-dive, then departure for Kauehi, big-game fishing, sunset at sea. Anchorage on the coral reef, scuba-dive or water sports. Lunch. Scuba-dive or water sports, kayak, troll fishing in the Kauehi pass, with the sun setting down. BBQ evening. Water sports of your choice, swim, scuba-dive. Lunch, option of a land excursion, exploration of the reef to look for shells, water sport or scuba-dive. Early morning departure for Toau, sunrise at sea, smooth sailing helped by the trade winds, breakfast, big-game fishing. Anchorage off of a stunning coral sand beach, water sports or scuba-dive. Lunch, option to visit a pearl farm, water sports or scuba-dive. Sunset on the lagoon, BBQ evening. Sunrise on the spectacular Toau lagoon, water sports, scuba-dive. Land excursion to look for shells, swim, coconut tasting (you will learn how to extract the coconut milk that is so prevalent in Polynesian cooking). Lunch. Water sports of your choice or scuba-dive. Sunset on the lagoon, dinner. Early morning departure for the northern end of Fakarava. 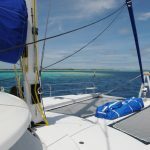 Short sail and anchorage off the coral reef. Snorkeling or scuba-dive in the famous Garuae pass (over half a mile wide!). Lunch, scuba-dive, then a smooth sail to the village of Rotoava. Last sunset with a cocktail, farewell party. Discover the cruise on Aqua Tiki II in video !